In 2018 Grohe AG, one of the largest shower manufacturers in the world, announced they will be continuing to invest in their range of brass, rose gold and nickel finishes on their range of bathroom solutions and kitchen fittings. Matt black however had no mention. With sales and promotion of matte black bathroom and kitchen tapware seemingly strong, why would one of the world’s leading brands decisively focus on everything but? After all, matte black is aesthetically pleasing, is modern and works well most colours particularly natural materials. The answer can be found in the longevity of matte black compared to its counterparts; chrome, brass or rose gold. Now that matte black has been part of mainstream design and construction for a number of years, and even with the PVD (Physical Vapor Disposition) process, it has a number of issues including fading, damage caused by general use and cleaning as well as its tendency to show marks such as dust and make-up. These product weaknesses will be controversial and perhaps not a problem if you’re prepared to change all the products in your hotel after a few years, but it seems the course has already been set and the trend lifecycle has dimmed on matte black bathroom and kitchen design. For hotel and commercial space design, this information provides two key points. Firstly, matte black products used in high traffic areas such as hotel bathrooms and kitchens or shopping centre toilets will look damaged and tired more quickly resulting in higher costs to replace to keep each space looking as sharp as it needs to. Secondly, the matte black trend seems to be over. 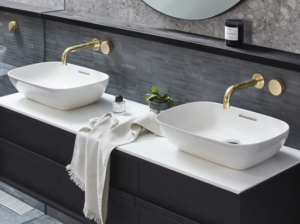 With the excitement of 2019, comes a myriad of ‘2019 Trends’ articles, blog and opinions with very few still promoting matte black bathroom and kitchen hardware. What do you think? 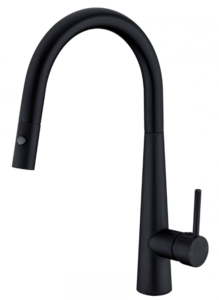 Will we see matte black tapware continue to be used in hotel and shopping centre facilities? If you have a question you would like us to answer, please contact us at design@theid.company. Best Hotel and Resort Design in Australia?